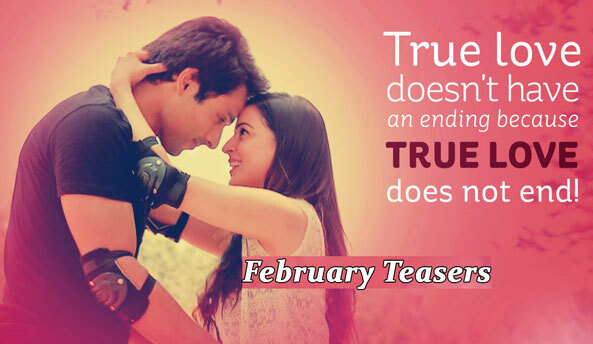 Read Forever Yours February Teasers 2019-StarLife as Veer makes sacrifices for the sake of Pakhi. Pakhi is angered when she comes to know that Veer loves her. Meanwhile, some strange attacks are targeted towards Veer. Who could be behind this? Veer’s sister wants him to take care of Paakhi. Meanwhile, Paakhi informs Girish that she will not be able to forget Anshuman. Nandini tries to find out the truth about Paakhi and Veer’s marriage from Maaji. The next day, Veer plans to learn about Paakhi’s hobbies and interests. Veer’s sister pampers Paakhi and Nandini is jealous about it. Paakhi is taken aback on finding out that Veer’s sister has misunderstood her to be pregnant. Later, Veer tries to gift a set of diamond earrings to Paakhi. She informs him that they should reveal the truth about their relationship to his sister. Veer strives to reveal the truth about his relationship with Paakhi to his sister. The next day, Veer lies to Paakhi that a client has gifted the diamond earrings to her. He feels happy as she tries on the earrings. Later, Nandini executes a plan to reveal the truth about Paakhi’s relationship with Veer. Veer tries to inform the truth about his relationship with Paakhi to his sister. Lavanya informs Paakhi that she has organised a puja on Anshuman’s death anniversary. Paakhi agrees to attend the puja. Meanwhile, Veer’s sister asks Paakhi to perform the rituals of karva chauth for him. Nandini reveals the truth about Paakhi and Veer’s relationship to his sister. Later, Veer explains to his sister about his relationship with Paakhi. He requests her to not speak to Paakhi about the same. Afterwards, Veer’s sister visits Lavanya’s house to meet Paakhi. Paakhi learns that Lavanya humiliated Veer’s sister. Meanwhile, Veer confesses to Lavanya that he loves Paakhi. Meanwhile, Paakhi decides to celebrate karva chauth for the sake of Veer’s sister. Later, Paakhi learns that Veer is in love with her and she is awestruck. Paakhi rebukes Veer for betraying her. Veer gets furious with Paakhi, and retaliates. Unaware of the fight between Paakhi and Veer, Riya and Ayaan make them break their fasts. Later, Veer’s sister meets Paakhi, and tells her to either accept or leave him. Veer’s sister blackmails Paakhi and tells her to accept him for Ayaan’s sake. Ayaan informs Paakhi that she and Veer have to attend the parents and teachers meeting in his school. Meanwhile, Veer’s sister plans to convince Paakhi to accept him. Veer becomes awestruck on learning that he left the main door of the house open. Veers sister blames Paakhi for his state of mind. The next day, Nandini tries to annoy Paakhi. Veer decides to decorate the house with lights, on the occasion of Diwali. A stranger plans to kill Veer by electrocuting him. Paakhi finds Veer handling a live electric wire. On seeing Veer with a loaded gun, Nandini misinforms Paakhi that he is trying to commit suicide. But Charu tells Paakhi that Veer is only pretending in order to gain Paakhi’s sympathy. Paakhi plays a clever trick to find the truth. What’s Veer upto? Will Paakhi be able to unravel the mystery? Veer’s sister gifts a diamond ring to him on the occasion of Bhai Dooj. A stranger places the diamond in the porridge prepared for Veer but Paakhi learns about the conspiracy. Who is the stranger? Will Paakhi succeed in stopping Veer from consuming the porridge? Veer’s sister finds the diamond in Veer’s porridge and assumes that he’s trying to commit suicide. She shares her concerns with Paakhi, but Paakhi believes that one of Veer’s family members is trying to kill him. Later, Paakhi stumbles upon a clue about the porridge. Will Paakhi discover the truth? Paakhi learns that Veer is in grave danger and vows to protect him from his family. In her quest for truth, she decides to install a tracker in Veer’s gun. With the help of the tracker, Paakhi finds Charu holding the gun. Will Veer believe the latest facts that Paakhi has brought to light? Paakhi finds Nandini meeting a stranger. Nandini informs Paakhi that the stranger is her lover, Kamal. In the night, Paakhi finds out that someone is adding antidepressants to Veer’s drinks. Who could be the culprit who is trying to take Veer’s life….. Will Veer believe Paakhi? Paakhi tries to convince Veer that his sister is trying to kill him but he refuses to believe her. Veer slaps Paakhi when she tries to stop him from consuming the spiked drink. Paakhi reveals the truth about Veer’s family to Riya. Will Paakhi and Riya be able to expose Veer’s sister’s true intentions? Veer’s sister agrees to get Nandini married to Kamal. Veer’s sister is furious when she discovers that Kuhu got admission in a co-ed institute. Paakhi tries to calm her down, but Veer’s sister humiliates Paakhi and rebukes her. Will Veer’s sister forgive Kuhu? Veer manages to convince his sister to forgive Kuhu. Paakhi saves Veer from tripping. She tells Veer that someone is trying to harm him. Meanwhile, Kamal goes missing. Where has Kamal gone? Paakhi discovers that Kamal is in contact with one of Veer’s family members. Paakhi meets Charu and finds out that Kamal is blackmailing her. Paakhi and Riya are determined to find the person trying to kill Veer. Veer agrees to help Paakhi find the person who is trying to kill him. Paakhi saves Veer from being killed by Kamal. Veer’s sister is determined to visit the hospital. Riya informs Paakhi that Veer’s sister is missing from the house. Why does Kamal want Veer dead? Paakhi is convinced that Veer’s sister, Tejaswini, is innocent. Nandini misleads Veer and takes him to a secluded place. Paakhi discovers that Nandini is trying to kill Veer. Will Paakhi be able to save Veer? Tejaswini saves Veer and Paakhi from Nandini. A couple blackmails Girish and Lavanya to transfer their property. Veer and Paakhi manage to apprehend the culprits and they save Girish and Lavanya. Later in the night, Paakhi and Veer exchange gifts. Will Paakhi and Veer get back together? Tejaswini motivates Veer to express his love to Paakhi. Later, Paakhi, Lavanya, Girish, and Riya surprise Veer by organising his birthday party. Paakhi finds it hard to build proximity between her and Veer, as she recalls Anshuman’s love for her. Will Veer sway Paakhi enough to get over her past? Veer makes Tejaswini realise Paakhi’s love for Anshuman and decides to divorce Paakhi. Meanwhile, Paakhi continues to reminisce about Anshuman. Veer sacrifices his love for Paakhi and asks her to sign the divorce papers. What will Paakhi’s decision be in this regard? Paakhi signs the divorce papers on Veer’s request. However, she is sad to leave Veer, and expresses her gratitude to him. Lavanya is proud of Paakhi for being loyal to Anshuman, while Paakhi engrosses herself in reminiscing about Anshuman. Will Veer and Paakhi be able to lead a reclusive life?